If you are passionate about luxurious housing designs, you would definitely crave for master bedroom ideas beside a pool. Well, you will get a pleasing view from your bedroom all the time, and enjoy the natural bliss of the place. When you decide on the poolside bedroom design patterns, you need to consider several factors like the vegetation around the pool, distance of the room from the pool and so on. Here are classy poolside bedroom design ideas for you. 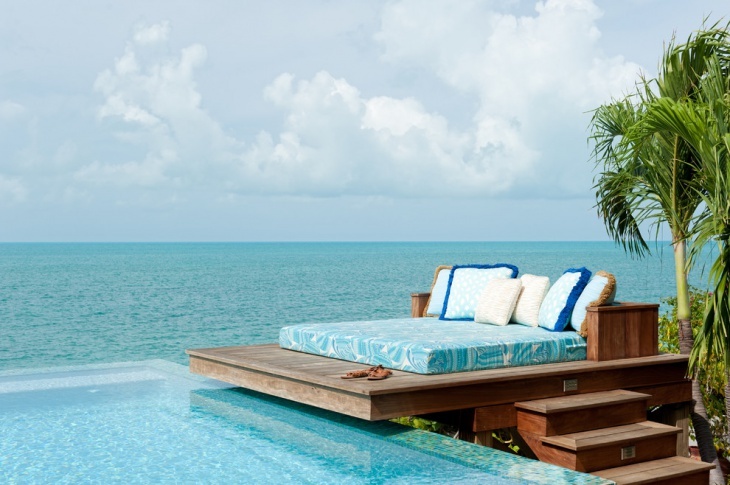 This is a beautiful poolside bedroom and you are free to dip your feet into the water anytime you feel like. There is a hanging ceiling with beautiful wooden interior in the room. This goes well with the natural colour of the pool. Opt for a cream colour for the walls of your bedroom. When you conglomerate a number of abstract ideas in your bedroom, make sure that there is a pool around. There are abstract designs on the walls and floor. This light coloured design goes well with the bedding accessories. A metal fireplace adds an extra touch of elegance in the room. The pool looks clear and beautiful. This is a small yard pool design with wooden decks to rest in. You will like the built-in platform beds right beside the pool. Use tainted wooden planks so that it complements the natural bright colour of the water. The place looks simply amazing when you sue the right shade of brown for the wooden planks. 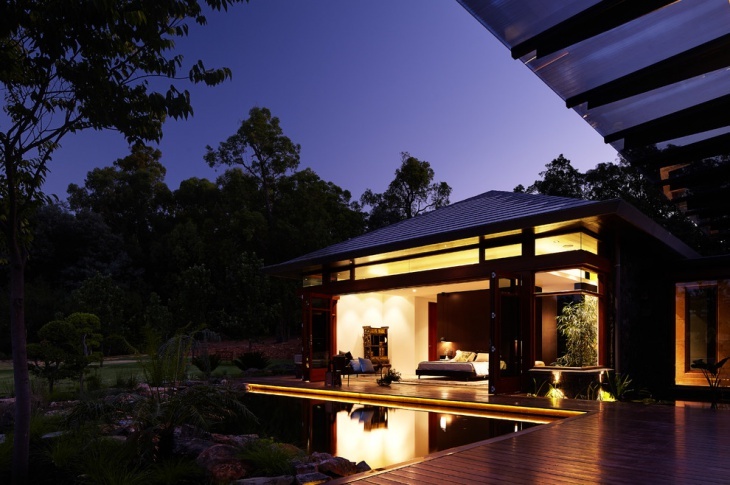 If you have a guest house in your home, you would look out for a perfect poolside bedroom design. Here, you will find white walls and concrete floors in the room. White-based bedding and other accessories in the room looks classy for this room. 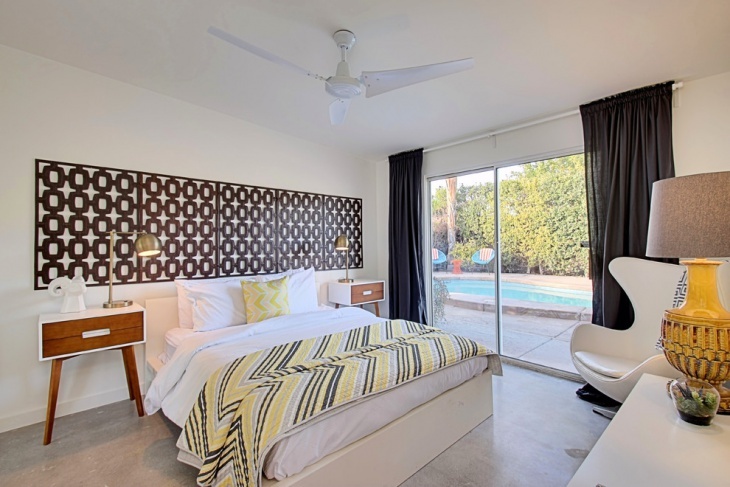 This is an ideal poolside bedroom design for mid-century houses. There are fence planters around the pool, and the setting looks awesome with a green trimmed turf around the area. 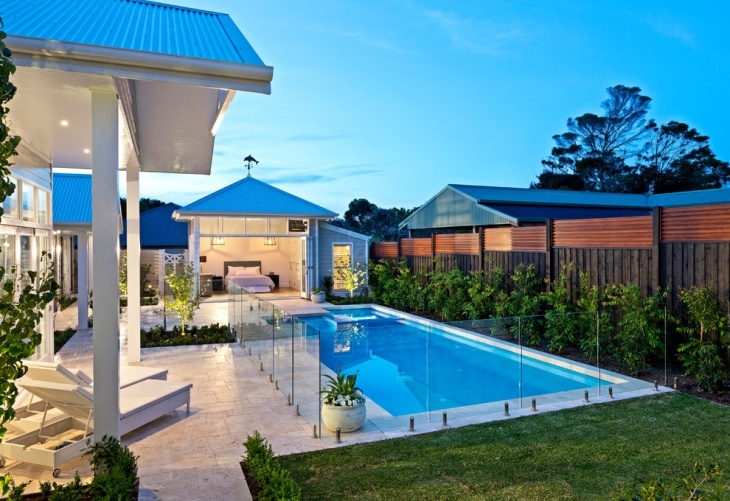 There is a glass fence around the pool and you will really be mesmerised by its beauty. In contemporary bedrooms, you will find vibrant shades of colours for the walls. The white wooden floor is ideal for this poolside bedroom. There is a textured rug on the floor, and this is compatible to the white ceiling in the room. If you long to spend long hours beside your backyard lake, arrange for a tropical poolside bedroom design. The pool deck is placed above the ground, and the entire setting with a wooden platform looks charming. Arrange for blue bedding accessories on the platform to create a math with the waters. 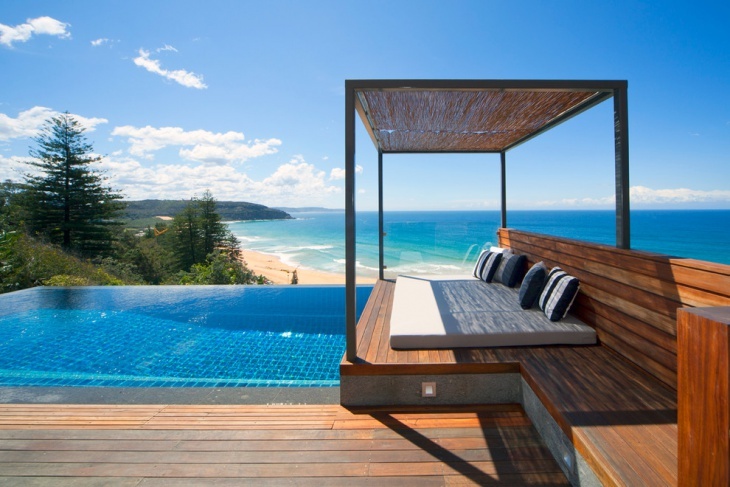 This is another design of poolside bedroom, that will give you a splendid view of the natural beauty of the place. The clear water of the pool is attractive, and you need to get brown walls for the bedroom. Place a few white boulders along the sides of the pool to confer it with a natural look. There are times when you crave for a simple and spacious bedroom beside a pool. Make sure that the room looks bright, and white walls serve the purpose well. you can install large glass doors in the room and incorporate the minimalist furniture idea in the room for best looks. 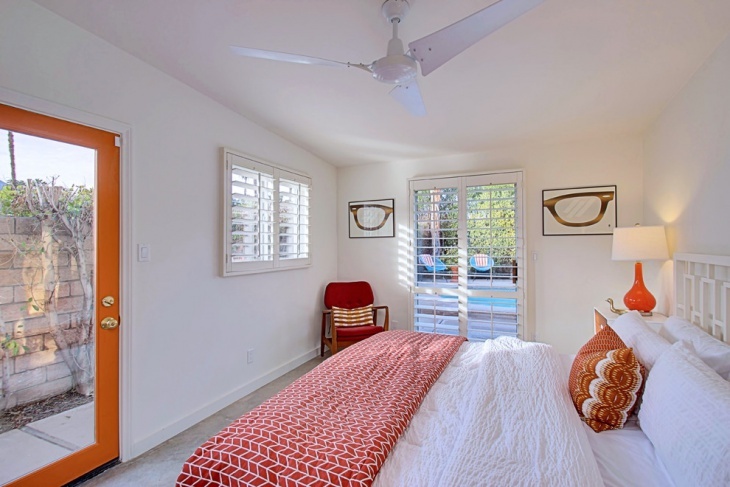 You can make a bedroom with limited space beautiful when you choose the right poolside bedroom design. There are natural stone pavers around the bedroom, and the small bedroom looks compact along with the pool. The light brown walls and floors look charming, and you can install matching furniture in the room to create a perfect match. You can easily integrate the small bedroom ideas with poolside bedroom design themes to create stunning features around your bedroom. Housing fashions thrive on experimentation, and when you are able to strike the right combination, you get sophisticated bedrooms beside pools.